Between the great eateries, character, Presque Isle Bay, Lake Erie, the lighthouses, the beaches of Presque Isle Peninsula, the amusements and roller coasters at Waldameer Park, the vineyards and wineries, the railroading, and more, sits a terrific habitat for wildlife. At no place is this habitat more evident than at Presque Isle State Park. You are sure to see wildlife throughout Presque Isle State Park, but the wetlands that make up the heart of the peninsula have the most biodiversity. Countless ponds, wetlands, and woodlands provide a home to so many creatures. Presque Isle State Park has been rated as one of the greatest places in the country for observing birds, with 320 different species of birds having been sighted at the park. We start off on the Presque Isle Bay side of the peninsula with a look at a Great Blue Heron that was fishing on the shores of the bay. These bird houses erected throughout the state park, and the great PA state park system, really help boost the bird population. The wetlands are a perfect place to watch wildlife in their habitats. There are many hiking trails that go through the different wetlands, in addition to kayak rentals if you want to paddle through the small ponds and wetlands. Trails and observation platforms have been erected through the different wetlands to allow for observation and minimal disruption of the habitat. Utilizing the trails and observation platforms is the optimal way for anyone like us that is into photography and anyone that does not want to immediately scare away the wildlife. We kept seeing motion in the water from the state park's many minks and beavers. This was the closest we were able to get to getting a good shot of the animals. They were all over the place, though we were unable to time when they would sporadically emerge from the water. You can even see the many fish that swim through the waters. And naturally those fish attracted the attention of this hungry Great Blue Heron, which stood fishing in this spot for easily more than twenty minutes. We watched the bird for likely more than twenty minutes. Don't cross mama goose! She had us square in her sights! Now off to the Turtle viewing platform at Graveyard Pond! This provides a great view of a giant log in the water where the turtles of Presque Isle State Park, namely the Common Map Turtle, love to congregate in May and June, and in late August and September, to get out and dry in the hot sun to rid their bodies of leeches, fungi, and algae growth. Watching the turtles is very entertaining, and this platform allows for viewing the turtles with minimal disturbance, something that is extremely important for both seeing the turtles, and for them to be able to complete the sunning, which is necessary for their survival. This one large log is often covered in dozens, if not hundreds of these turtles and it is extremely entertaining to watch. We saw fish and mink in our time watching the turtles. The best shots we were able to catch of the mink. When you get to the lake side, you are sure to see some waterfowl, or at least a ton of people flying kites! The Tom Ridge Environmental Center, located at the entrance to the state park, has a great interpretive center that talks about the wildlife on the peninsula, history, and more. It also has a huge observation tower. The tower provides awesome views of the lake, peninsula, and Waldameer's Ravine Flyer II Roller Coaster, one of the best wooden roller coasters on the planet. On other visits we have seen deer, turkeys, foxes, frogs, and more. 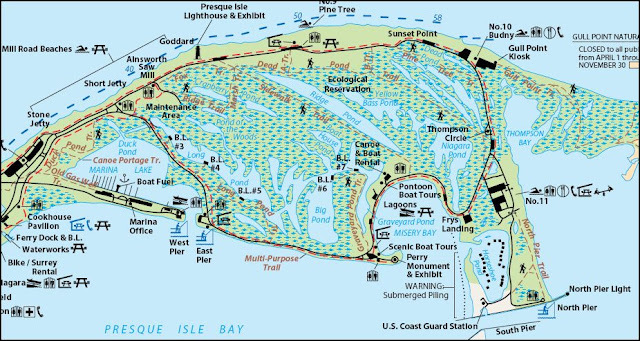 We highly recommend exploring the center of the peninsula at Presque Isle State Park, to see the beautiful habitats and so much more. The mannerisms of the blue heron remind me of an elder man, and then sometimes a bashful sleuth. When on land, they are a delight to watch in motion.